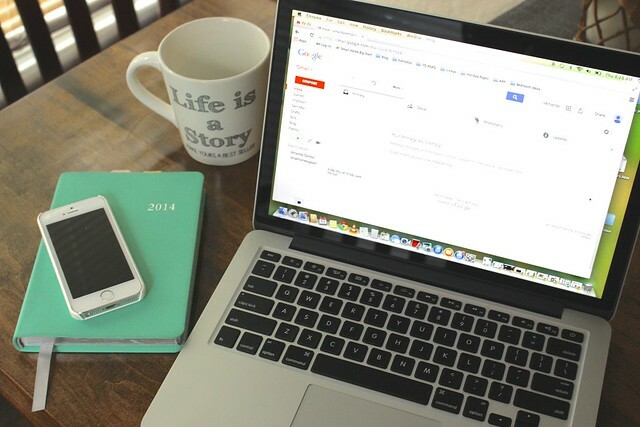 Between my full time job, part time job, the blog and everyday life, I have no less than five emails that I check on a regular basis, and I’m sure that there are lots of you out there who do the same. When I first started thinking about this post, I talked to some friends and family to see how they managed their email, and I was surprised that many of them weren’t using their email to it’s full potential. 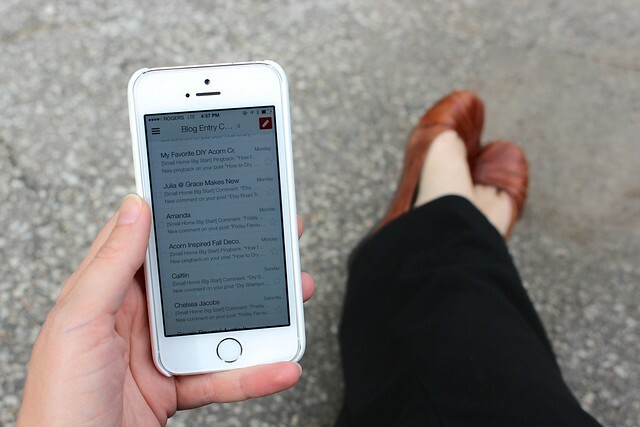 Maintaining a clean inbox that doesn’t drive you bonkers is easier than you think. 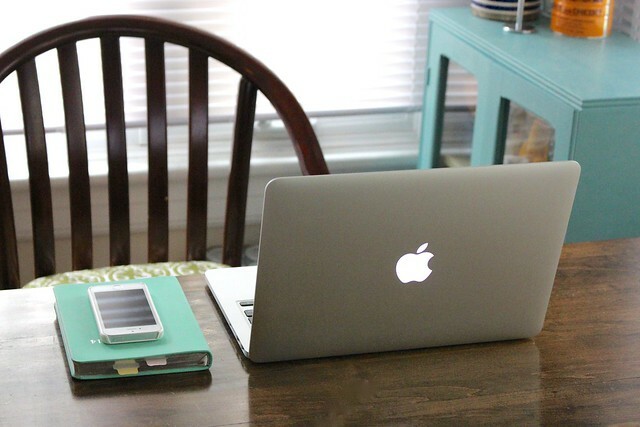 It just takes a little time to set up/clean up and create a routine that works for you. The biggest thing you can do to clean up your inbox is to unsubscribe from all the unnecessary promotional emails that we all get. It’s super easy to do – just scroll to the bottom of the last email you got from them and you should see some fine print at the bottom giving you the option to “unsubscribe”. Click that and follow the steps. By eliminating these junk emails you can get rid of the bulk of it. I only keep the subscriptions of a few stores that I shop at often and if I really want to see what promotions are on at any given store, I can usually find it one their website. You can also nip this in the bud in the stores themselves. It feels like every store I go to now asks for my email address at the checkout. I always politely decline or say that I already get their emails. That way I don’t get added to another mailing list. I also turn off all the notifications from social media that I check anyway, like Facebook or Twitter. I don’t need to get those in my inbox and the just clutter it up. You can also check out unroll.me, which shows you all the subscriptions you have and let’s you unsubscribe to all of them at once. I did it the other day and found that I had 34 subscriptions I could get rid of that I didn’t even know I had! For each of my email accounts, I set up a bunch of folders to help me file away emails as soon after I read them. This way they are out of my inbox and also filed in a way that I can find them again later. It’s important to set up a folder system that works for YOU. There are lots of different ways you can approach this, but here are a few examples of folders and what I’d put in them. Accounts – Whenever I set up a new social media account, I put all the confirmation emails and login info in here. Readers – Any correspondence with readers, its also where I usually archive any questions, so I can go back and find them again if someone else asks it. If you’re archiving many years of emails, you might want to start with just grouping the older emails by year. ex. 2009, 2010, 2011, 2012, 2013. Then you can start sorting your 2014 onward emails into more specific folders. Now that you have your system in place, go through everything that’s in your inbox and sort it. 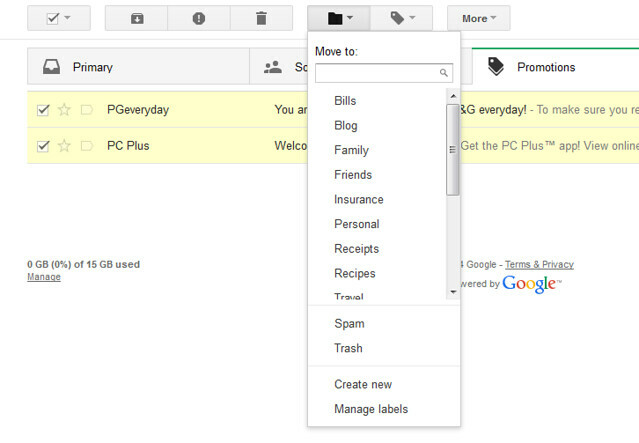 With Gmail, you can select multiple emails at once by clicking the box beside the emails you want to archive and then selecting the folder you want to move it to from the “Move to” drop down menu at the top. This should leave you with only emails that you still have actions you need to complete. If I read an email and don’t respond then, I’m more likely to forget about it. When I open an email and its something that I can deal within a couple of minutes, I do it right away. Then I archive it in the proper folder or delete it. If there are emails that require more of a response or an action, I flag those as important and leave them until I have more time to answer them. When I’m standing in line at the grocery store or sitting in a waiting room at the dentist, I use that time to clear out any of the junk that has come in or write back quick responses. At the end of the day, I check my email again to see if there is anything else that needs to be done. I try to take care of as much of it as a can then so that when I get back to it the next day, it’s only new emails. On Friday afternoons, I try to take 15-20 minutes to sort through anything left outstanding in my inbox and take care of them. I like to know that by 4pm on Friday all my emails and correspondence has been taken care of, because I know there will be even more there when I get back online on Monday. 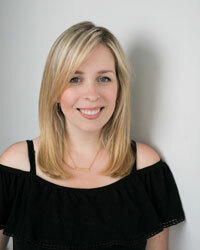 It was this time last year that I went to BlogPodium and sat in a great seminar by Jordana from White Cabana (who is also one of my fellow roundtable speakers this year!). She talked about the zero inbox – a goal I’d love to obtain, but it isn’t a reality for me right now. I may not be able to get to that zero inbox most days, but I make sure that before I shut down that computer at the end of the day, I can see the bottom of my inbox. It’s flexible and much more forgiving. I’m all about goal setting, but it’s important to make sure that they’re reasonable for you, so if I set the goal as seeing the bottom and hit it, I feel like I’ve accomplished much more than always aiming for zero and not hitting the mark most days. Really quickly, it becomes a subconscious goal and just part of your everyday. Now when my inbox starts to creep over to the bottom of the page, it prompts me to take care of it. For most responses, you should be able to do it in five sentences or less. If you go over that you’re using up not only your time, but also the recipient’s! 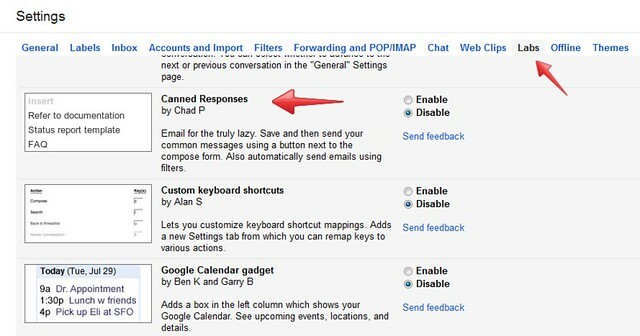 If you’re using Gmail, there is a Google Lab add-on called Canned Responses. If allows you to answer an email once and then use that same response any time someone else emails you about this. You just have to edit it to personalize it for the new recipient. This has been a huge time saver for the blog, where I often get emails from readers asking the same question or inquiries from companies that I don’t think are a good fit for the blog. 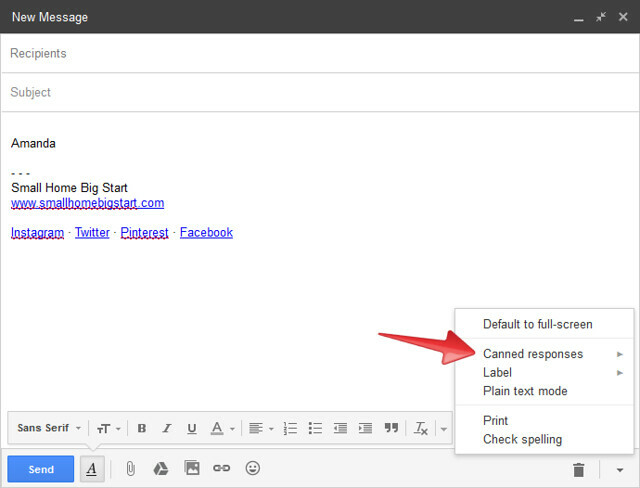 If you go to your Gmail settings, under Labs, you’ll see Canned Responses. “Click enable”. When you open up a new compose box, type in your response and click on the drop-down menu at the lower right corner of the box. Clicked Canned Responses, then Save New. It’ll ask you to add a title and that’s it! The next time you want to use that Canned Response, open up a new compose box window, go to that drop down menu and select the one you want to use. You can do something similar in Outlook, but creating an email template. In a new email window, type up the template you would like to create. 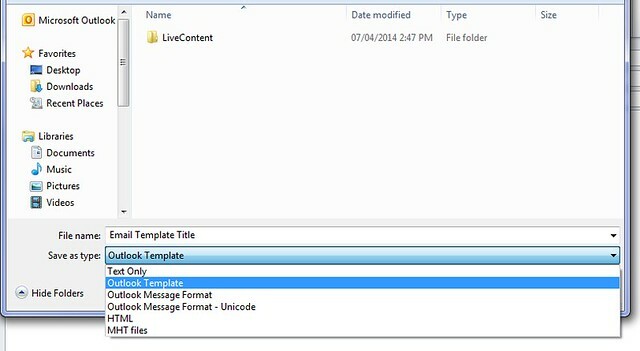 When you go to save it, select the file type as “Outlook Template” and save it on your computer. The next time you want to use that template, click on the file to open it, personalize the message for the recipient and hit send! I hope that you are able to take something away from this discussion that helps you combat your inbox and make it easier for you. If you have any questions or suggestions, leave them in the comments below or give me a shout! This was super helpful! Thx so much for the awesome roundtable today too. It has me motivated to get organized!